WHEN Dannie Abse lost his wife in a horrific car crash two years ago, the future looked bleak. Devastated by his loss, the poet and novelist found he no longer had the will to write, that his mind was no longer ­“prepared” for poetry. He grew increasingly introverted and his thoughts turned to ­suicide. 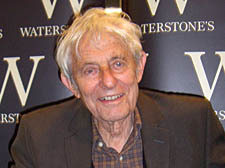 Fortunately for poetry lovers this was not a permanent state of mind, as Mr Abse proved last week to an adoring ­audience in ­Waterstone’s on Hampstead High Street. The great Welsh writer and former doctor read excerpts from his highly personal recent memoir The Presence (Hutchinson £15.99) – the ­cathartic journal he kept following his wife’s death. “When I came out of hospital I found I had writer’s block as a result of my post-traumatic whatever,” Mr Abse said with a wan smile. He admitted he had initially “felt some unease” at the idea of his “very personal ­memoirs”, which detail his profound sorrow and rays of hope, being ­published. “Overall though, I think I’m glad,” he said. The painful resonance of some of his readings caused the 84-year-old poet to falter on ­occasion, but even in his grief Mr Abse remained stoic and life-affirming.